Recently, my wife and I were shopping at a major grocery chain store that sells natural and organic foods. We noticed some signs that were posted in various places with the message: “Give bees a chance” – a catchy play on words from John Lennon’s song, “Give peace a chance”. 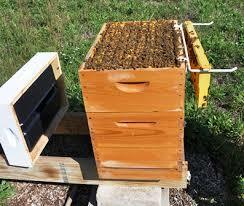 The purpose is to attract public attention to the fact that the honey bee population is rapidly declining. What’s happening to the bee population is a mysterious phenomenon called “colony collapse disorder”. Adult worker bees suddenly vanish, leaving the hive deserted except for the queen bee and her brood, who cannot survive without them. Everyone involved in the bee industry is perplexed by this sudden change in natural behavior. Scientists have become suspicious that a particular type of pesticide known as neonicotinoids could be the cause for the problem because it is absorbed by the plants, ends up in the pollen, and is ingested by the bees. Their research is showing that this chemical is toxic to the insect nervous system. Honey bees are an evolved, highly social insect. They live in large colonies where individual bees (queen, workers, and drones) are specialized to perform specific tasks. The abnormal and unusual change in activity leading to collapse of the colony suggests that the honey bees’ neurological functions, specifically memory, cognition, and/or behavior, became impaired by the chronic, seemingly sublethal exposures of pesticide. Recent studies exposed bees to low doses of these pesticides for 13 weeks, and then compared the findings to similar hives without these exposures. The absence of dead bees in these colonies was striking. They didn’t just die; they left the hive and vanished. What would make them do this? Are bees another example of canaries in the coal mine? Is the absence of the buzz of the bee warning us that low dose exposures of neurotoxic pesticides, at levels considered to be safe and non-toxic, can be toxic to our brains too? Pesticides can impair human brain development and function in a way that affects social interactions, learning and behavior. Just like bees. Exposures to pesticides is associated with the development of autism. According to a recently published study, children with mothers who live close to fields treated with organophosphate pesticides during pregnancy are about 60 percent more likely to have autism. Children whose mothers had pesticide exposures are more likely to have mental development and pervasive developmental problems. Not concerned because you don’t live near a farm? What about the pesticides we eat every day. In fact, children who consume higher amounts of vegetables have higher levels of pesticides in their bodies. We teach our children that fruits and vegetables are healthy foods. We should also be teaching them to eat organically grown food. Even though some organic produce has recently been found to have traces of pesticides, it’s still better than receiving the full dose! It is easy to find lists of the most contaminated fruits and vegetables. The Environmental Working Group publishes a list of the most contaminated produce, they call the dirty dozen – at least we should be trying to find these foods organically rather than conventionally grown. Scientific research is showing that although pesticides can be a significant contributing factor for the upsurge in cases of autistic spectrum disorder they are just one environmental factor that pushes some children over the edge. Women who live in areas with polluted air are almost twice as likely to have an autistic child, and living close to a freeway while pregnant is worse. A combination of genetic and environmental factors can trigger autism. While there is a clear genetic predisposition, the number of children being diagnosed continues at an alarming rate, emphasizing the fact that there must be a major impact from the environment. Autism used to be diagnosed only in children with severe language and social problems and repetitive behaviors, but the criterion was expanded to also include a wider range of developmental disorders, referred to as autism spectrum disorder (ASD). Some people argue that the diagnosis of autism has increased because of a wider awareness and broader definitions. But even since we changed the definition, the numbers continue to rise. The US Centers for Disease Control and Prevention tells us that now 1 in 68 children has ASD. There are plenty of measures that we can take to help reduce the risks. Prospective mothers can be more aware and start reducing their exposures before and during pregnancy. Almost 30 studies have been published showing evidence that the fetus is exposed to pesticides, but there are many other pollutants from the mother passing through the placenta as well. Doctors should be advising their patients of the dangers of chemical exposure even before they become pregnant in order to lower the chance of devastating, adverse outcomes. The American College of Obstetricians and Gynecologists and the American Society for Reproductive Medicine state that, “By the first prenatal care visit, exposure to toxic environmental agents and disruptions of organ development may have already occurred.” Their concern is not just because of the rising numbers of kids with autism. Although statistics can be dry, it’s important for everyone to know that the prevalence of developmentally delayed kids is increasing. Between 1997 and 2008, the prevalence increased by 17.1%. In the USA, that’s 1.8 million more challenged children compared to the previous decade. Now one child in six has a developmental disability! If you are considering having a baby, now’s the time to start reducing your exposures by eating organic foods as much as you can, and avoid chemical pollutants whenever possible at work, in your homes, and on your bodies. Check out the Air Quality Health Index or Air Quality Index online. It tells you how clean or unhealthy the air is in your town and helps you to decide when to reduce physical activities to decrease your intake of air pollutants. We are responsible for our children from the very beginning. We need to start protecting them better before our future generations start collapsing, just like the bees. This entry was posted in News and tagged Air Quality Health Index, ASD, autism, colony collapse disorder, fetus exposed to pesticides, insect nervous system, pesticide exposure, the dirty dozen. Bookmark the permalink.